1’ - Anddddddd @cdchivasusa get us going here in the first half of #SEAvCHV ! 2’ - Clint and Oba trying to take on five Chivas USA players. Unfair to the visitors. 3’ - Ohhhhhh sneaky little ball there by Pappa played over the top to Oba but Kennedy out to get it. Look out for those, yo. 4’ - Sounders knocking the ball around with ease here. Testing Chivas early on. 4’ - Oba with the silly spin and turn thing that just fakes the pants off his defender, slides to Mike, to Lamarrrrrr whose cross goes over. 6’ - Tackle from Ozzie and it’s a beaut. Hearts. 7’ - Sounders forward again and Oba gets a weeeee little bit of space and shoots but blocked. I LIKE THIS THOUGH WORLD. I LIKE IT. 8’ - Now Deuce gets some space out wide and cuts inside. His shot is saved there by Mr. Dan Kennedy. 8’ - JUST SILLY! The ball movement by the #Sounders at the top of the box. Unreal. Oba to Clint BACK HEEL TO OBA WHO SHOOTS…wide. 35’ - Sounders getting a bit frustrated here. DeAndre with a foul that sees the defender raise his arms in displeasure. 36’ - FK from Chivas meets the head of Borja who heads right at Frei. Phew. 36’ - GOALLLLLLLLL!!!!!!! NEAGLEEEEEE TIES IT UPPPPPPP AT 2-2!!! 37’ - Pass played through the middle and deflects of a Chivas defender righto into Lamar’s path in alone on goal. Slots by Kennedy. 2-2! 38’ - RT if @LamarNeagle is your #253 bae ???? 41’ - Ohhhhhh jee bus…Pappa with the side foot flick thing into Clint who just can’t get it under control. 41’ - From there, Clint plays in to Oba whose chip into the area is short so CLINT TRIES TO FLICK IT UP AND AROUND THE WORLD TO HIMSELF. 42’ - He pulled it off, too…just a bit too close to goal. Man alive. 44’ - Marco Pappa is just so slippery on the ball. It’s like glued to him at all times. I hearts it. 45+ - Two minutes of added time coming here. That’s one and TWO. 45+ - GOALLLLLLLLLL DEMPSEY SCORES! CLINT AND OBA. OBA AND CLINT. JUST UNSTOPPABLE!!! 45+ - Just unreal ball movement there. The reverse ball AGAIN as Oba just slides it right into Clint who tucks it by Kennedy for a 3-2 lead! 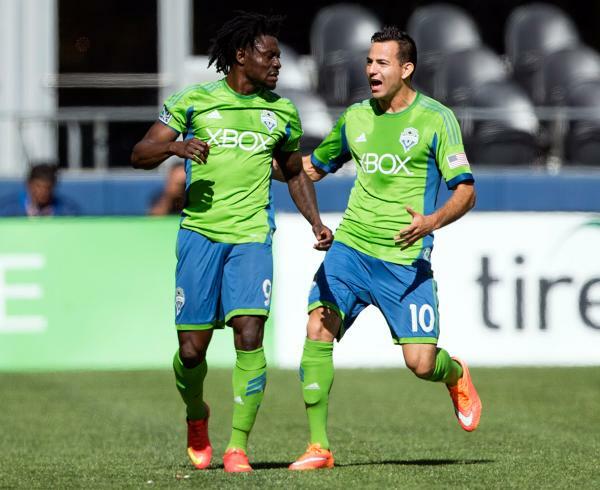 45+ - @oba_martins now has 14 goals, 10 assists. That’s nice. HT - TEAMS ARE BACK! FT - Welllllllll this has been @shanevans with you for another fantastic @SoundersFC match here at @CenturyLink_Fld . 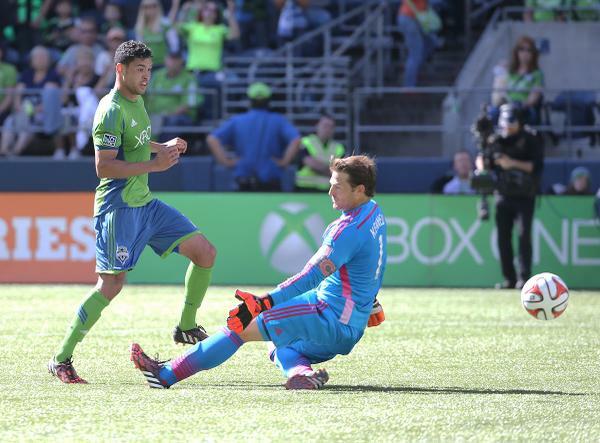 #Sounders with a powerful performance today after 1st half flutters. Controlled the game. Martins 2 goals make it 15 total-a club record. And of course, today's 4-2 win for @SoundersFC over Chivas USA means 50% off any LRG or XLG @SEAPapaJohns pizza Sunday! Use code "SFCWINS".